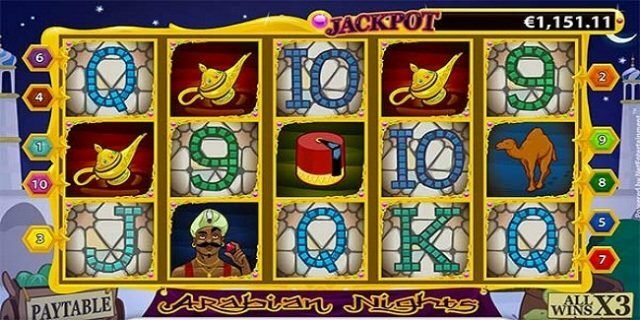 Arabian Nights Slot is 10 paylines and 5 reels progressive slot game powered by NetEnt software platform. It offers a huge jackpot to the players. The coin per line for the game is 1, while coin size for the game ranges from 0.5 to 0.5. Return of the player percentage is 95.6%. This slot game is inspired by Aladdin and the prince. The scatter symbol of this game is Aladdin’s lamp, whereas wild symbol is the prince. You can play this game for free or with the help of real money at any NetEnt online casinos. Three options available in this game are “Spin” which is used to Spin the reels at the chosen bet, “Auto” is used to Play the game multiple times uninterrupted and “max Bet” option is used to Spin the reels at the maximum wager. You would receive 15 Free Spins if land on 3 or more scatter symbols on any active reels. Free spins can also be re-triggered when another 3 or more scatter symbols appears on the reels. You will receive 10,000 coins when 5 Prince Symbols appear on the reels.